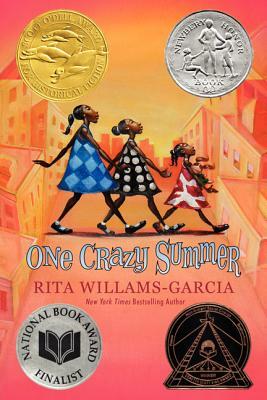 One Crazy summer is a Newberry Honor Book about the struggles of three young girls going to visit their mother whom they never knew. In this story, the sisters and their mother learn to accept each other for who they are. Delphine and her two younger sisters are visiting their mother, Cecile. She left them after the youngest sister was born, so they couldn’t call her mother just yet. Mothers are supposed to greet kids with milk and cookies after a long day, not leave them because they can’t give them a name they like. When the girls are older, their father tells them that they are ready to go visit their mother, but when the three girls arrive at their mother’s house, they are not welcome. Cecile doesn’t have the time or money to cook them meals. Delphine and her sisters stand in line at a shelter for breakfast every day, are told to stay out the entire day and come back with a takeout dinner. Delphine wants to tell Cecile that this isn’t right but she doesn’t know how to stand up to her mother. Cecile is always busy or in a bad mood. She and other African Americans are part of a group called the Black Panthers who stand up for their rights but are always having to run from the police. When Cecile gets arrested one day for speaking out at a Black Panther rally, the girls are left alone. Delphine and her sisters also get involved with the Black Panthers and Delphine knows that no good can come from this.